It is interesting how mass marketing absorbs our minds and narrows perception of certain brands, in my case this has happened with Bregenz Festival, which has been put on my list mostly as summer opera event to be “checked off the list”. I was coming to see lake stage in the sunset with its impressive visuals, expected a diverse crowd of holidaymakers from all 4 countries encircling Lake Konstanz, and have read impressions emphasising weather impact on performances. 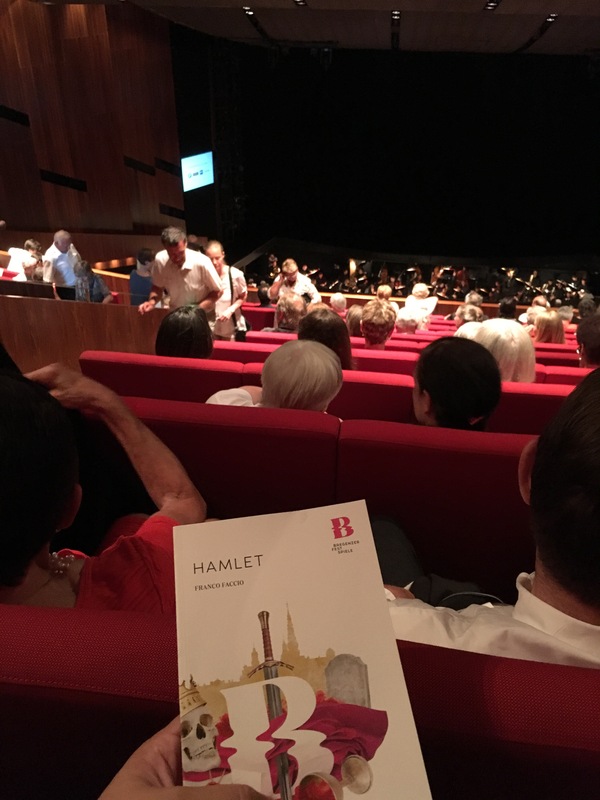 To complement the trip, I have arranged it in a way to include more that one performance, and luckily there were 3 shows of Hamlet by Franco Faccio scheduled, including the premiere on July 20th. Both composer and his work were unexplored territories, so the trip was set accordingly. The venue of Bregenz Festspielhaus is impressive development as includes both modern and spacious indoor theatre with a huge stage equipped to support any creative ideas of set designers and directors, and is complemented by outdoor seating for approximately 7 thousand spectators with lake stage on the north side. The audience was well dressed on a conservative side, and there were many enthusiastic opera fans as you could read from their reactions to stage events. Interesting is the story about the opera, being rediscovered quite recently – just on November 2014 Opera Southwest, based in Albuquerque, New Mexico, which inspired Opera Delaware to stage the performance in May of 2016. “Amleto” by Franco Faccio with a libretto by Arrigo Boito was first staged in Genoa in 1865, with following revised production in La Scala in 1871. Since the unsuccessful beginning, Boito never wanted to renew it, and as Anthony Barrese, the artistic director of Opera Southwest discovered, the score has never been published, nor any materials from those performances survived. Based on composer’s manuscript and some excerpts the score was reconstructed. Probably, if Faccio would have lived in another time period, the opera might be noticed and received much more praise from the audience. The libretto by Boito is exceptionally good, as he has managed to condense system of characters and events into required framework of Italian opera, keeping all major themes and providing Faccio with a foundation to create musical drama supported by melodious, intense score. One of the basic questions for each Hamlet staging is: To be or Not to be? This can go as far as the Hamlet asks: What is life all about? What’s death? Is existence real? Is this all a game? These are questions throughout story of Hamlet by Shakespeare. The world as a stage, our life as a game, the meaning of our existence. If we cease to play a role, then where is one’s soul? The production is visually adorable – the use of colour and light, interesting solutions for set design and transforming objects, like dressing tables turning into catwalk for Ofelia’s entrance, details of the costumes, which are catching attention – all those contribute to creating half-surrealistic ambience on the stage. Amleto (Hamlet) does not really fit in the crowd, even if he tries to. Frank Philipp Schlößmann uses concept theater in theatre, lit up curtain with frame bulbs and another one in the distance, intro with rising spotlight farm, turntable and polished or mirrored floor reflecting each movement and doubling impressions, – all that work perfectly well with idea put forward by Olivier Tambosi. The cast was confidently led by Paolo Carignani at the pit, and Wiener Symphoniker demonstrated well-balanced ensemble and beautiful soft tone. 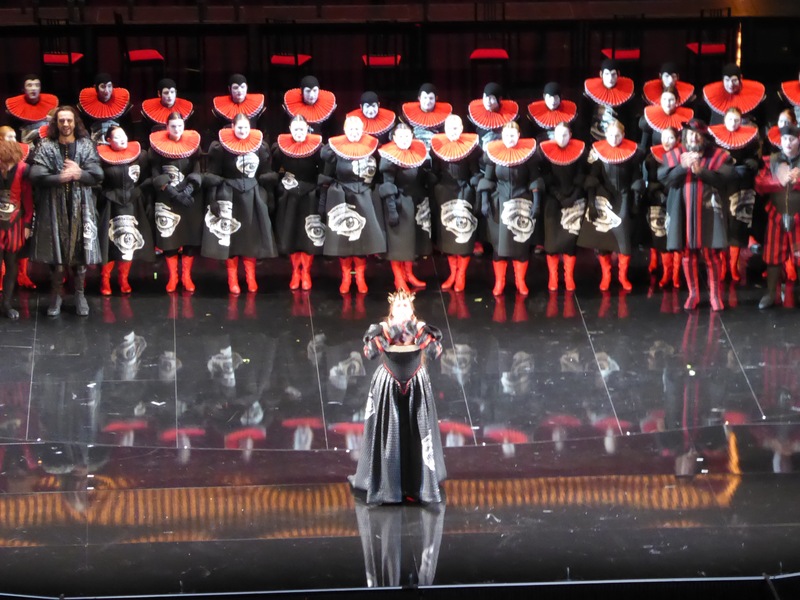 Pavel Černoch as Amleto improved over performance, and some unevenness observable at the beginning vanished in the second half, thus painting dramatically and vocally convincing character. Impressive performance from Claudio Sgura as Claudio, King of Denmark, less so of Dsamilja Kaiser as Gertrude, Amleto’s mother, as some of her appearances were strong and stable, while other suggested minor vocal challenges. 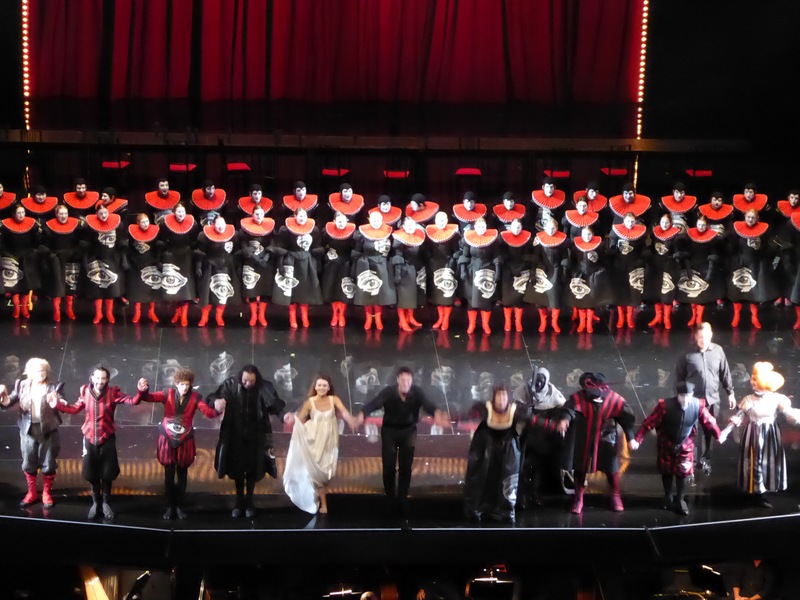 Even though Iulia Maria Dan as Ofelia did great dramatically, her vocal performance was uneven, and sometimes lost below orchestra and partners on stage. Good job by Mika Kares by supporting indisposed Ghost of Amleto’s father – Gianluca Burrato, who performed the acting, while Kares sung it from the side pit, – as per explanation of the administration, the sickness being unexpected, Mika had less than two days to learn the role. As the were quite a lot of non-german speaking people in the audience, it would be advisable to complement surtitles also for English speakers, as not all the audience is so well acknowledged with the libretto, especially for rarely staged operas. In overall, the performance was very good, the ensemble did their best, and combining all the winning aspects of the production, this is work worth to repeat and show to wider audiences, as it is a pity to see only three performances in one location for all the effort invested in creating the show.